We always remember people if they had contributed something to our happiness, tension or may be daily life. Basically, people become famous when they do something extraordinary. Basically that extraordinary is a good thing. But some of us barely know the darker side of the so called famous personality. Yes, there is some fact about our beloved famous figures that would surely give you 100 watts of electric shock. Muhammad Ali, the famous boxer, decided to walk forward in the direction of boxing cause of his stolen bicycle. His name was Classius Clay before he became a boxer. There was an incident in his early life that made him hit the gym. One time he and his friend were at the Columbia auditorium. When he came back he realized that his cycle was stolen. It was very valuable for him. The frustrated Classius told an officer that he wanted to beat up the thief. Coincidentally the officer was a boxing coach. He replied, ‘well you better learn how to fight before challenging people.’ That is when Ali’s passion began. It is assumed that a person named Fulcanelli made the impossible work, possible. Can you imagine how can a lead be converted into gold? But the founder still in darks. No one knows what’s his real name or what does he do or whether he is married or not. That person is still a complete mystery. Some believed that the person doesn’t exist in real life and the name is used by his master Canseliet. He might have published on Fulcanelli’s name but there were mistakes in the theory and the mystery is still unsolved. Yes, you heard right. Bell was not the real inventor of the telephone. It is believed that telephone was the real idea of a person named Antino Meucci. The main problem was his poverty. As per the rumors, the story is something like this. Antino had the idea of the telephone but due to his poverty, he filed half patent. He could not afford a full one. Then a tragedy took place in the form of boiler explosion where Antino was severely injured. When he came back, he came to know that his wife sold all his experiments and everything in the lab for $6 for his medication. Still, he didn’t give up and made another model for western union telegraph company. But they also let him down and after 2 years, bell filed a patent for the telephone and Meucci was sued. When anyone comes up with the name, Martin Luther King, the 1st thing that comes to his/her mind is his motivational speech. But guys do you know that this were not his own works? Yes, all his works were plagiarized one. Dou you remember his infamous ‘I have a dream’ speech given at the republican convention in 1952 was originally given by Archibald j. Carey, an African- American lawyer in Chicago. Not only this, many of his works is plagiarized one. You might have many fascinating novels like Romeo and Juliet, As you like it etc. 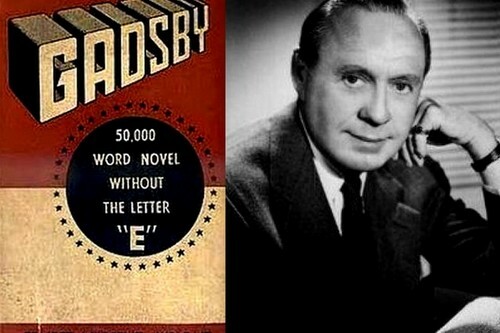 but ever heard a novel named ‘Gadsby’? This novel is one of a kind. The speciality of this novel is that this novel has 50,000 words and none of them has the letter ‘e’. Yes, you heard it right. Might be thinking how is that even possible? This impossible work was done by Ernest Vincent and all he did was taking out the letter ‘e’ from his typewriter. But he faced a lot of problems because many words like, he, she numbers between seven through thirty were off limits. But the book was criticized after its release. Thanks for the marvelous posting! I truly enjoyed reading it, you might be a great author.I will be sure to bookmark your blog and may come back very soon. I want to encourage yourself to continue your great posts, have a nice afternoon! Hi there, yes this paragraph is actually nice and I have learned lot of things from it about blogging. thanks. What’s up to all, it’s actually a pleasant for me to visit this site, it contains valuable Information. Good post. I learn something totally new and challenging on websites I stumbleupon every day. It’s always helpful to read content from other writers and use something from their web sites. My brother suggested I would possibly like this blog. He used to be totally right. This put up truly made my day. You can not consider just how a lot time I had spent for this info! Thank you!